Munich – 12 September 2018 - Every time a power MOSFET is switched on or off in a switched-mode power supply (SMPS), parasitic inductances cause ground shifts. This can lead to uncontrolled switching of gate driver ICs. In extreme cases, this results in electrical overloading of power MOSFETs and malfunctioning of the SMPS. To solve this problem, Infineon Technologies AG (FSE: IFX / OTCQX: IFNNY) offers the 1-channel low-side gate driver ICs 1EDN7550 and 1EDN8550. Both of the gate drivers belonging to the EiceDRIVER™ family have truly differential control inputs and can effectively prevent false triggering of power MOSFETs. 1EDN7550 and 1EDN8550 are used in industrial, server and telecom SMPS as well as wireless charging applications, telecom DC-DC converters and power tools. The EiceDRIVER 1EDN7550 and 1EDN8550 are immune to static ground offsets up to ± 70 V. Safe operation is guaranteed at dynamic ground offsets of up to ± 150V. All this is possible without having to cut ground loops. Since the gate driver ICs have truly differential inputs, only the voltage difference between the two inputs is decisive for the switching behaviour of the gate driver IC. The 1EDNx550 EiceDRIVER are ideally suited for controlling power MOSFETs with Kelvin source contact. These gate driver ICs provide more than adequate robustness against ground shifts due to parasitic source inductances of the power MOSFET. Compared with galvanically isolated gate driver ICs, these single-channel low-side gate driver ICs are more space-efficient at lower cost against to traditional solutions. In addition, the 1EDNx550 family is a cost-effective solution for applications where the distance between a control IC (providing the control signals to the gate driver IC) and the gate driver IC is greater than usual. This may be due to product design requirements, printed circuit board technology of choice or daughter card concepts. What these constellations have in common is that parasitic ground inductances are the cause of ground shifts between the control IC and the gate driver IC. The 1EDNx550 family solves these challenges and shortens product development times. The devices of the EiceDRIVER family 1EDNx550 are now available to order. Further information is available at www.infineon.com/TDI. 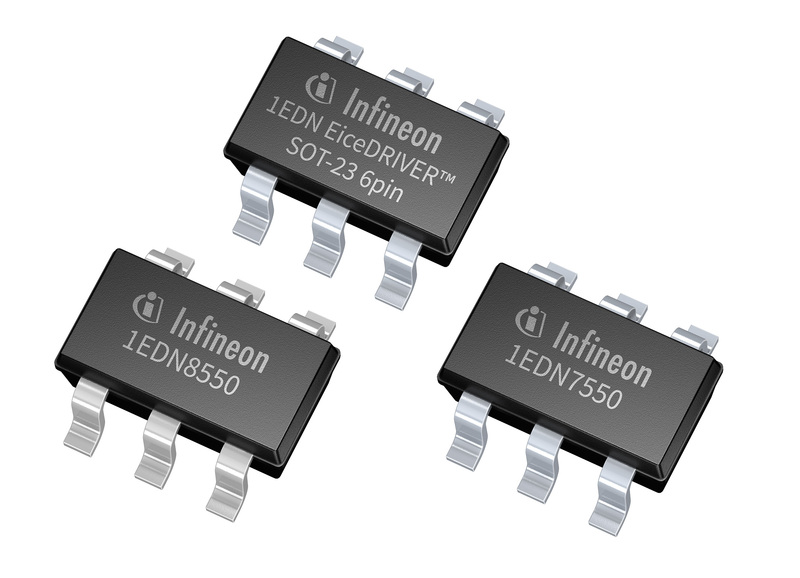 The 1EDNx550 EiceDRIVER ™ are ideally suited for controlling power MOSFETs with Kelvin source contact.